The funny thing is that I’ve mentioned this flavor a couple of times when reviewing other Lay’s flavors, but I haven’t bothered to post a review of this flavor. So lets get this done and out of the way. Months and months ago when I first got a bag of this flavor of chips, I was a bit hesitant to even to even try the flavor. I put this flavor into the same novelty flavor category as Heinz Ketchup flavored chips. 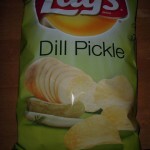 I mean really, dill pickle? 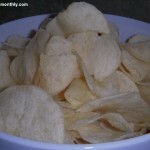 It kind of threw me for a loop, kind of like Old Bay Flavored chips. But for a couple of bucks I might as well give them a try. Not really knowing what to expect when I tried these chips, I just dove head in. 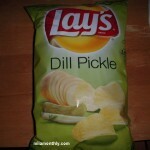 And overall, I have to say that I liked these dill pickle flavored chips. I won’t necessary eat then all day everyday, but they do fit the bill to quench my vinegar fix, if it ever pops up. 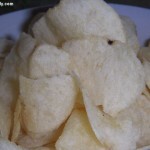 But how do these compare to the old baby blue (Lay’s Salt & Vinegar)? Click here to find out.